The three entities of Somalia (Central and Southern Somalia, Puntland and Somaliland) took part in Livestock, Livelihoods and Gender workshop, which was organized by IGAD LPI from June 8 to 10, 2010 in Djibouti. The training was timed to prepare members of policy fora that IGAD LPI has established in the 3 Somali entities, as they embark on process of agreeing the livestock related development priorities for Somalia. At the end of the workshop, participants expressed their view that the training enabled them to understand the nature of policies in the livestock sector that are likely to deliver benefits for poor women and men. They also said that the training was supporting the livestock policy dialogue that the project is facilitating in Somalia. 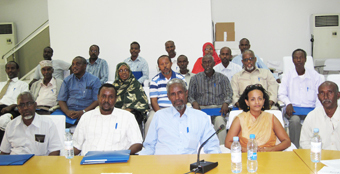 In a related development, Dr Abdi Jama organized an aside meeting with the Director Generals of the Ministries of Livestock of Somaliland, Puntland and Transitional Federal Government (TFG) along with representative of Sheikh Veterinary School (STVS) on the implementation of the Central Information Node hosted by the Reference Centre at STVS to support evidenced based policy making in the Somali livestock Sector. In effect, the Director Generals agreed to establish a sub-Node in their respective ministries. This would involve appointing an officer and office to assemble and upload information into the IGAD LPI Livestock Information Portal and to feed that information into the policy development process engaged by their respective Technical Working Groups. Dr Abdi Jama has also met with the IGAD LPI national team in Djibouti to review progress on of the Policy Hub on adequate representation of livestock in PRSP in the country. The team has plans to conduct several meeting in the coming months to identify priority areas and to develop proposal to be included in the new phase of PRSP that is expected to be concluded in October 2010, it was learnt.